A recent study published by Cambridge University revealed that people who live or work close to fast food outlets have an increased likelihood of obesity simply because it means they are more likely to be tempted to eat unhealthily. It seems we are simply unable to restrain ourselves when we are presented with the opportunity for a quick fix of cheap, highly processed, energy-dense food. The Cambridge University report reminded me of a notorious incident that occurred several years ago during the campaign by celebrity chef Jamie Oliver to improve school meals here in the UK (he later took his campaign to the United States, encountering similar levels of resistance). Many of the children at one school in south Yorkshire rebelled against the new lunchtime healthy food regime. They were encouraged to do so by some of their parents, who were caught passing burgers, chips and fizzy drinks to the children through the school’s perimeter fence. That act of dissent was a shocking testament to our nation’s addiction to “bad” food as well as our lack of understanding about what constitutes “good” food. But those parents were doing what they did because their children, brought up on a diet of processed junk food, found Jamie Oliver’s “real” food regime unpalatable. The parents were simply giving their children the food they were used to eating. They were also, symbolically, reinforcing in the next generation a deep suspicion of any food that does not come packaged in plastic or cardboard or in an aluminium can, as well passing on an increased likelihood of food-related chronic illness in later life. Don’t hold your breath over the chances of this dismal state of affairs being tackled seriously at a formal political level any time soon. In a testament to the power of lobbying by the food industry, shortly after the UK coalition government came to power it invited McDonalds, KFC, Pepsico, Kellogs, Unilever and Diageo into the heart of government to help write its policy on obesity, alcohol and diet-related disease. Time for a recipe. 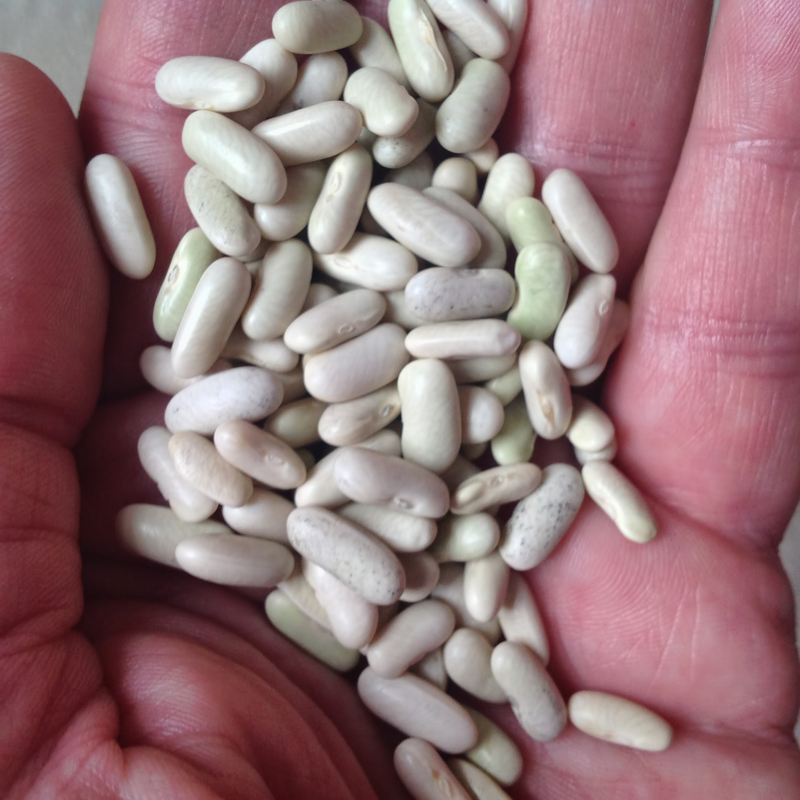 Here I’m using some more of my stored flageolet beans, from a variety of dwarf French bean called Safari which I grow on my allotment plot, the Circus Garden. Dried flageolet beans are fairly easy to source and, to save time, you could always use tinned flageolet beans, although the flavour won’t be as good. In this recipe I’m pairing these beans with leeks, the hardiest and often the longest surviving vegetable on the Circus Garden. The recipe is vegan and full of rich and appealing flavours, and I recommend you try it as it is. However, if you can’t bear the idea of your risotto without Parmesan and/or butter then you can easily substitute these for the nutritional yeast at the final stage. Nutritional yeast is available in health food stores and some supermarkets. It is an inactive yeast, a completely natural product, a good source of vitamin B12 and adds both richness and flavour to this dish. 1.For the crispy leek garnish, pour groundnut oil into a suitable pan to a depth of 3 cm. Place the pan over a high heat. When the oil is hot enough to brown a cube of bread within 30 seconds, carefully put the thinly shredded leek into the oil. Cook for 2-3 minutes until the leek is just starting to colour and turn crispy. Remove from the oil with a slotted spoon and drain on kitchen paper. Set to one side. 2. Place the stock in a large pan. Bring to the boil then turn to the lowest setting and leave to simmer. 3. While you are heating the stock, heat the olive oil in a separate large pan over a medium heat. When the oil is hot add the onions and cook, stirring, for five minutes or until the onion is soft and translucent. Add the leeks and the garlic and cook, stirring, for a further 5 minutes until the leek is soft. 4. Add the rice and dried thyme and cook for a further 1-2 minutes, stirring to ensure the rice grains come into contact with the oil. 5. Turn up the heat and pour in the wine, stirring to deglaze. Add the sea salt and a ladle of stock and reduce the heat back to medium. Keep stirring, adding a ladleful of stock whenever the rice starts to look dry. After 20 minutes add the flageolet beans. 6. Cook for a further 5 minutes, stirring frequently. Test the rice to see if it is cooked. When ready it should be “al dente”. If it isn’t ready, continue adding stock and stirring as before. You may not need to add all the stock. 7. Remove from the heat, and stir in the nutritional yeast and half of the chopped parsley. Serve the risotto in bowls, with a topping of crispy leeks, the remaining chopped parsley and a drizzle of truffle oil. I wonder if people who live or work close to a garden or allotment where they grow their own vegetables have an increased likelihood of healthier eating! 😉 I think the answer is YES! The recipe looks delicious with the crispy fried leeks, thanks for sharing. Hi Chava. Thanks for your comments. I agree – I read some interesting research quite recently on the positive health benefits of growing your own food, which concluded that it can lead to improvements in mental as well as physical health. Totally agree with Chava. And how wonderful that the beans are your own stored ones, never quite grow enough for this but inspired to plant a few more. Hi Andrea, and thanks for your comments. I always have plenty of dried French beans but only because I fail to harvest them all when they are at their best! Hi Sarah. Thanks for your comments. The flavour combinations in this risotto went down well in my household, so if you try it I hope that it also manages to pass your daughter’s stringent taste test. I’ve made a variation of this before and it was beautiful!